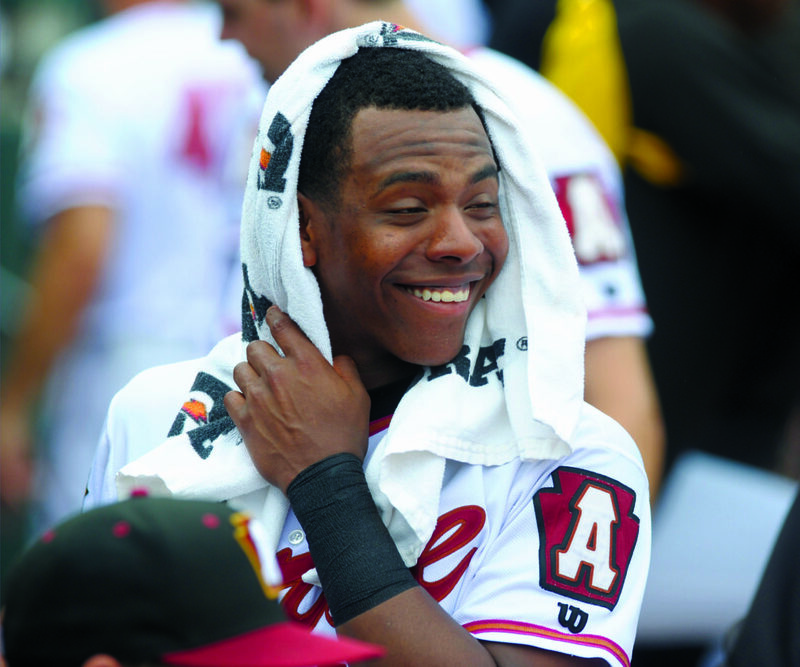 Mirror photo by Gary M. Baranec The Curve’s KeBryan Hayes keeps cool with a wet towel in the dugout during Thursday morning’s game. Jin-De Jhang has a knack for bringing fans to their feet with timely hitting. The man responsible for arguably the biggest hit in Curve history — a go-ahead three-run triple to help capture the 2017 Eastern League championship — was at it again Thursday afternoon. Jhang delivered a walk-off single to defeat Akron, 4-3, before 4,921 fans at Peoples Natural Gas Field to end the series and the month of May on a high note for Altoona. For the second game in a row, the Curve won via a walk-off hit, this time on a hit to shallow right field that was just deep enough for a racing Elvis Escobar to slide under the glove of RubberDucks catcher Sicnarf Loopstok and ignite the on-field celebration yet again. A strong 6• innings from Curve RHP Mitch Keller (5-2), in which he struck out six and allowed two runs, appeared to be enough for Altoona to hold on to a 3-2 victory and save the need for Jhang’s heroics. But the bullpen blew yet another lead, this time in the ninth inning, when Akron’s Willi Castro scored on a sacrifice-fly with the bases loaded. Keller, the top prospect in the Pirates’ organization, has excelled against the RubberDucks in 2018, allowing only three runs with 19 strikeouts in 18 innings of work. Curve RHP Geoff Hartlieb (5-2) was tagged with his fifth blown save in an inning of relief but wound up with the win when Akron RHP Mitch Brown (1-3) surrendered the game-ending walk-off hit to Jhang. Despite the celebratory and upbeat nature of the locker room following the game, the Curve manager had some trepidations about his bullpen’s performance that continues to plague the team. Jhang’s sequel season to his clutch hit in the 2017 championship game has been anything but ideal. The catcher from Taiwan injured his arm playing winter ball in Australia and didn’t make his 2018 Curve debut until May 14. Since then, Jhang has played in seven games and is hitting .231 as he splits playing time at catcher along with Christian Kelley. Jhang said after the game that the only other time he hit a walk-off was in 2015 with the Pirates’ high-A team in Bradenton, but he loves the feeling of doing it for his first time in Altoona. Key stat: 3B Ke’Bryan Hayes went 2-for-3 and has a hit in nine of his last 12 games, hitting .333 during that stretch. Bottom first: Alemais tripled, scored on Hayes single (1-0). Top fourth: Bradley solo homer (1-1). Bottom sixth: Hayes singled, scored on Martin two-run homer (3-1). Top seventh: Marabell reached by wild pitch, scored on Tom single (3-2). Top ninth: Paulino walked, pinch-runner Castro scored on Krieger sacrifice fly (3-3). Bottom ninth: Craig singles, pinch-runner Escobar scored on Jhang single (4-3). Tonight: Altoona at Hartford, 7:05 p.m. LEADING OFF: RHP Mitch Keller stifled Akron batters for over six innings less than a week removed from his worst outing of the season, in which he walked a career-high five batters and surrendered a season-high in runs (6) and hits (9) against Harrisburg. STEALING SECOND: CF Jason Martin punctuated his marvelous month of May with a two-run homer in the sixth inning, his sixth home run of the month. Martin hit .359 in May and ranks sixth in the Eastern League with his .327 average. ROUNDING THIRD: Despite the bumpy month, the Curve actually finished May with a .500 record of 14-14. Altoona has only had a losing record in one of the last nine full months of baseball. HEADING HOME: The Curve have a brief three-game road trip to Hartford this weekend, then after a day off Monday, will be home all next week, with three games against Reading and three against Hartford.